Tonight I will be watching the Packers and the 49ers do battle in the playoffs. This morning I gathered my three Packer’s shirts (one is in the laundry), and asked my husband and daughter to each pick one for Packer playoff day. I was anticipating some resistance but was surprised that with a little coaxing my husband decided to wear one. My daughter was actually excited to wear one! A few months ago I brought my daughter to Inspired for You on a day I was working in the store. She looked at all the handmade items and liked what we were selling. One of the things she fell in love with was a green and gold Packers inspired tutu. “I want this!” she said repeatedly. I am frugal (no, not cheap!) and a self-proclaimed DIYer. My daughter knows this. She did ask, “Can you buy me this?” She quickly changed that question to: “Can you make me one?” I should have bought one to promote the store, but I knew I would save money making my own. I have made tutus for sock monkeys I sell. I waited for Hobby Lobby to have a sale on their tulle and bought the needed yardage. Up until last weekend I had not made my daughter her tutu. Last Friday I worked in the store again. I decorated a dress form with Packer inspired clothing, took a picture and posted it on Facebook for promotion. 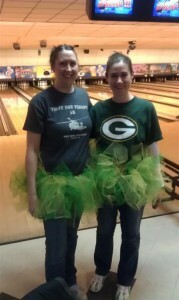 One of the items was the green and gold tutu. I thought to myself later that night, “Now is totally the time to make that tutu. I could actually make two tutus and bring them to bowling when the game is on, and it could be a lot of fun.”I ran this idea past my daughter (I did not want her to feel like I was stealing her tutu! ), who was fine with me “borrowing” her tutu. My sister and I each wore one and they were passed around by several people. We had so much fun! The Packers won! We even bowled well! Tonight, my daughter will be wearing HER good luck tutu. I will be wearing my Packers shirt watching and sleeping. As of yesterday I am sick with some sort of something that makes me very tired and my head hurt. Nonetheless, I am excited for the game tonight and really hope they win!